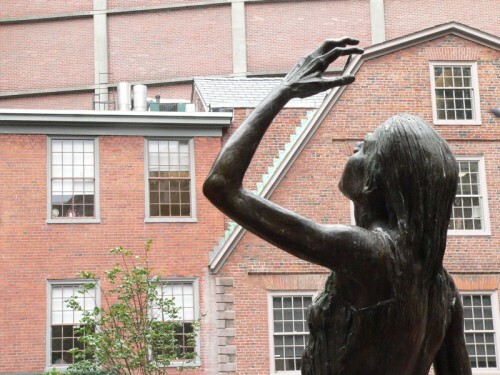 As you follow the Freedom Trail or go about your business in the changing landscape of old and new buildings that make up downtown Boston, at the corner of School and Washington Streets you’ll come across a statue — a pair of statues, actually. 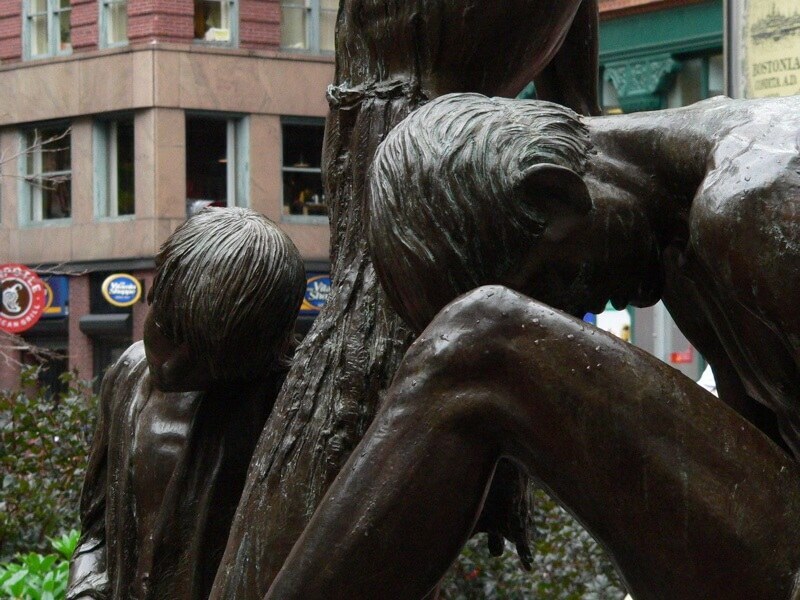 This is the Irish Famine Memorial. One one side there’s a family clearly affected by famine, the woman reaching up to the heavens to ask for help while the man sits with his head hung down. Across from them, a prosperous looking couple hurries by with what seems to be a glance back at the other family. Ever since I first saw these works of art, they’ve bothered me, tugged at me, and caused me to think I needed to spend a bit more time with them. One crisp autumn afternoon I decided to do just that. There was a band playing Caribbean rhythms on the walkway right near the memorial. There were tourists walking by with their maps and books guiding them along, perhaps to look at the site of the Old Corner Bookstore across the street — in the seventeenth century it was the home of religious dissident Anne Hutchinson and in later years housed the publishing company Ticknor & Fields, the publisher of Henry David Thoreau’s books. These days it is home to a fast food restaurant, and skyscrapers rise a around it, a co existence often found in Boston architecture. But back to the statue. I thought, the first time I saw it, that it was a bit dramatic — melodramatic, even. The figures stayed on my mind, though, so on that crisp autumn afternoon I decided to spend a bit of time with them, taking them in and learning about their presence on the street where they live, so to speak. The ways in which each of us brings his or her own context to understanding and being reached by an artist’s creativity was one thing I wanted to think about while in the presence of these statutes. The differing ways people connect with the ideas of art was also something that time spent sitting by the famine memoria caused me to reflect upon. The Great Hunger, a time in the mid nineteenth century when many Irish died and many left Ireland, shaped life and history on the island of Ireland itself. It had impacts too on those countries Ireland’s far flung sons and daughters came to find their ways and make their homes, countries including the United States, Canada, Scotland, and Australia. 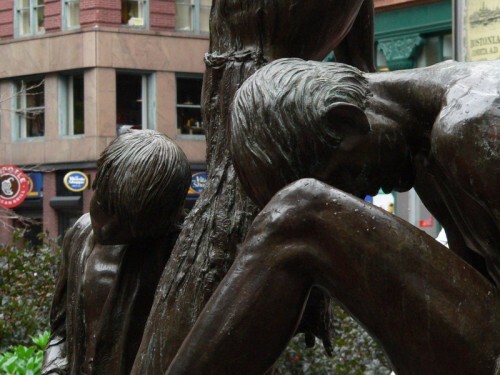 The Irish community in Boston, a community with deep and long roots in Ireland, decided to commission sculptor Robert Shure to create a memorial marking this time. The memorial was put in place in 1998. I’ve been immersed in Irish music and Irish history all my life, have studied these things and written of them, and spent quite a bit of time in Ireland, and seen a few emigration statues, too, ones of people made both frail and strong by circumstance. As I was thinking that afternoon, as I sat with the figures and watched people passing by, I was reminded that art is both distillation of ideas and communication of them. More than I had at first realized, Shure had left room for those who pass by these figures, whether they give but a glance or stop to spend time, read the plaques which explain who the figures are and why they are there, or come close and touch them, to bring — and take away — their own understanding of hunger, history, and emigration. Not that those subjects are easy to distill or to take in all at once. There have been shelves and libraries of books written about the Great Hunger, immigration, and all the things arising from those circumstances. I think artists may have the best of it, though. Galway Bay by Mary Pat Kelly and Gracelin O’Malley by Ann Moore are novels with very different main characters which both help give human dimension that time and place. So too do the song From Clare To Here which finds an emigrant looking back and missing home, and the song Rathlin Island (1847) about a person who stays in Ireland watching the ships sail away..
Photographs are by Kerry Dexter. Than you for respecting copyright. Kerry Dexter is one of five writers who contribute to Perceptive Travel’s blog. You’ll most often find her writing about travels in Europe and North America in stories that connect to music, history, and the arts. RSS feed and connecting with us through your favorite social networks. Thanks! Medicate your kids! We can't hear ourselves fly.